With nearly 13,000 total reviews that include more than 9,800 5-star customer reviews on Amazon, there’s really no question that the Mpow 059 Bluetooth Headphones are high-quality headphones. 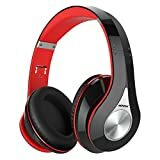 On top of customer sentiment, they also have the coveted “Amazon’s Choice” designation, and they’re the best-selling over-ear headphones on Amazon’s entire site. If you haven’t yet checked them out and you’re hunting for new headphones, give them a try before you drop $200+ on Beats. Trust us, you’re going to be impressed with the quality and performance you get for just $35.